One day I decided to look at my own face in the mirror, for a change. I lifted the painted veil – and had a real shock! 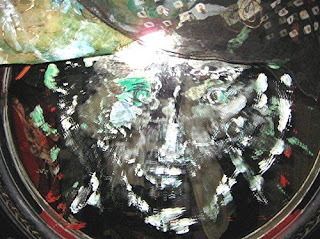 Before me was a beautiful spirit face, impressed on the mirror itself. I had always wished to rescue Osiris from being a mummy and having to sit and judge people in the Underworld. At last, here he was (8) Osiris Unbound. No longer a mummy but a living God! I added small pictures of Isis, Venus & Brigid, Goddesses of compassion. 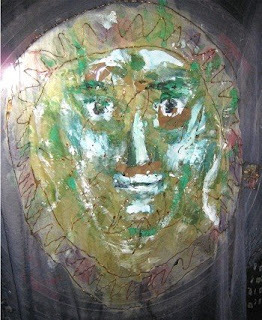 Amongst other witnesses, it is interesting to note that Johnny Merron, who visited Clonegal over Easter, saw successive images on the veil, as had I myself. Many people had felt the powerful energy arising from the earth at the Equinox, as one stood before it. However, as I arrived later the same day that Olivia lifted the veil for the first time, she greeted me in total amazement, and without explaining further, urged me to go and see what had happened. In the darkened Chapel, before my eyes, the formerly masculine image on the veil, became fleetingly but truly feminine, as the deeply compassionate gaze of the God on the mirror beneath revealed itself. God and Goddess united in two aspects of the One! We convey our thanks as always to Archdruidess Minette Quick, for her continual encouragement and support of Olivia's work and the Fellowship of Isis.